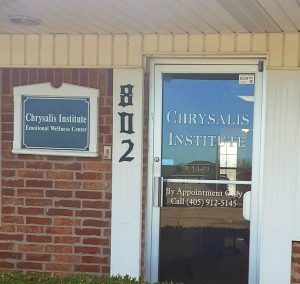 Chrysalis Institute Emotional Wellness Center is located on the corner of NE 19th Street and Eastern in Moore, Oklahoma. Just like the caterpillar who needs a chrysalis to transform into a beautiful butterfly, you also need a safe place to heal and transform yourself into the person you were meant to be. The name Chrysalis is a metaphor for our services. We help people who feel certain area(s) of their lives no longer work for them. We do this by creating a safe place with all the right tools to help you achieve progress swiftly and safely.